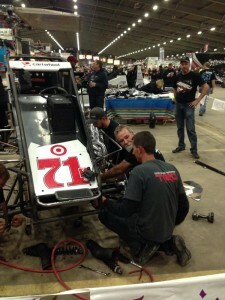 Chili Bowl opener is all Kyle Larson | Talking Speedway, Speedway news from around the world! Chili Bowl opener is all Kyle Larson what a drive ! The 29th Chili Bowl started in the most disastrous possible way for Larson and Keith Kunz. Getting his Chili Bowl off to an early start in heat one did little for Larson after starting from position 10 he suffered car damage during his progress forward resulting in a broken drag link and front shock. The team pulled out the spanners and worked to ready the car for the C Main so that the car could return to contest the remaining races. Return he did winning the C main then B to gain his start in the William Cat Preliminary Feature. The task for Larson from position 17 was to make one of the top three positions to advance to the big Diller Final on Saturday night. A daunting tasks for many but for Larson just another challenge. After 4 laps the Elik Grove driver had moved inside the top 10, the little Beast Toyota, What a feeling! Up front the race lead was a battle between Loyet, Jones and Daum and it was not long before the POWRi Champion had taken over the race lead. Daum looked strong and fast and was increasing his every lap. The cautions might have played into Larson’s hands but you need to have that special ability to make the caution your friend. By lap 20 the traffic started to come into play and would be the downfall of Zach Daum the POWRi Champ when he had to shut down to miss the spinning levi Jones #56 and Alex Bright . Larson had the opening and from that point on it was no contest as the Kunz Kid took the field apart as only he. Larson would cross in first from Loyet and Brayston while Daum would recover after restarting ROF to finish in 9th place. The night belonged to Kyle Larson, spectacular form to win the C, B and A Features. It was not a happy night for New Zealand’s Michael Pickens after having a flat at the start of his heat and being unable to get it fixed before the race started , the Kiwi found himself on back foot needing to qualify through the 2nd B main . 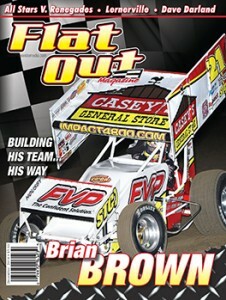 Pickens made the A Final and was running strongly from P 20 to 4th when he ran out of fuel, how is it possible? Pickens would fade as a result and finish in 8th place. 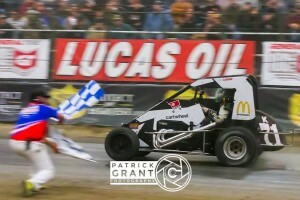 This entry was posted in Chili Bowl, Midget Speedcars by admin. Bookmark the permalink.